Line a baking sheet with parchment; lightly spray parchment with cooking spray. Combine sugar and water in a medium saucepan. Bring to a boil over medium-high heat. Cook, NOT stirring but instead swirling the pan occasionally, 10 to 15 minutes until sugar dissolves and turns into a dark, amber-colored syrup. Remove from heat; immediately and quickly stir in Cheerios™, almonds and cinnamon. Quickly spoon mixture into a thin layer on prepared baking sheet. Let cool completely, about 15 minutes, before breaking into pieces. 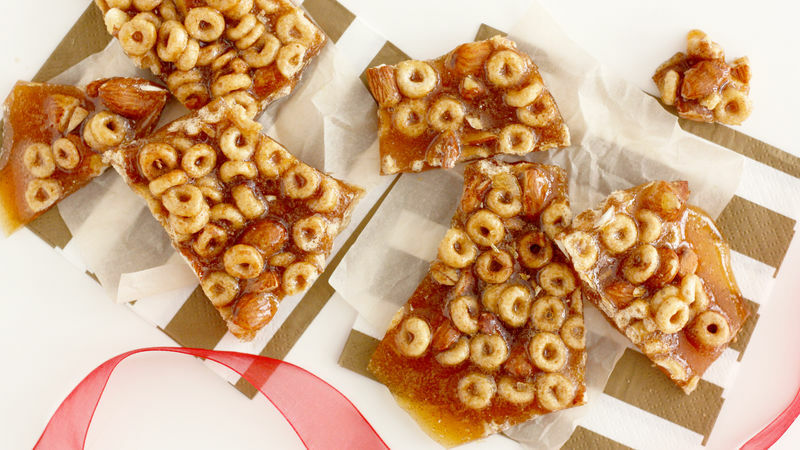 This peanut-free brittle will feed your candy craving with all the same sweet crunch. Well, lookie here! We have some serious cereal brittle action going on – and you’re going to want to be a part of it. This Honey Nut Cheerios Cinnamon Brittle is full of sweet and spice and everything nice, and it’s ridiculously easy to make, too. Do I see a slam-dunk edible holiday gift before my eyes? Yes...yes I think I most definitely do. Here’s how to get this brittle into your life. First, make sure you have all your ingredients ready and measured out. Once the sugar mixture caramelizes, the process goes like Speedy Gonzales so you won’t have time to measure things out then. Combine the sugar and water in a medium saucepan over medium-high heat. Once it comes to a boil, swirl the pan occasionally (DO NOT STIR. I mean, please do not stir the mixture. It won’t be pretty). Cook the sugar mixture until it caramelizes and turns a deep amber color. Next, remove the pan from the heat and oh-so-carefully but oh-so-quickly stir in the Cheerios, cinnamon and chopped almonds. Then quickly (but carefully!) spread the mixture in a thin layer on a lightly greased, parchment paper-lined baking sheet. Let the brittle cool completely and harden before breaking it into pieces. That’s all, folks! Now package it up like the good little elf you are and give to friends and family – or stash it all in your bedside drawer for a little holiday midnight snack. I won’t tell Santa if you don’t. Stephanie (aka Girl Versus Dough) may or may not have gone for the bedside stash route. FOR THE BABY. Check out her Tablespoon member profile for more of her personal recipes!